AUSTIN, Texas — Hector Barreto, president of the pro-business Latino Coalition, has joined the Trump administration in trying to persuade Latinos that a 2020 census citizenship question is nothing to fear. But Arturo Vargas, executive director of the bipartisan National Association of Latino Elected and Appointed Officials (NALEO) who also is working on upping responses, said that with the level of fear that the Trump administration has created regarding immigration, those assurances aren’t enough to prevent an inaccurate census in two years. Each decade, the government enlists help from various civic and community groups to encourage people — particularly those difficult to reach, remote or less trusting — to fill out and return their census forms. But the Trump administration has created a conundrum for many groups that serve Latinos and immigrants because the Census Bureau plans to ask people on the 2020 census to state whether they are a citizen, U.S.-born or naturalized or not a citizen. “The fear and distrust are broad and deep,” said Vargas; NALEO assembled teams in 2000 and 2010 to encourage people to be counted and plans to do the same in 2020. “What is becoming troubling to me, is they (the Census Bureau) seem to be proceeding on a business-as-usual approach when the train wreck has already happened and is coming down the tracks,” he said. On the one hand, an under count of Latinos and other households with immigrant family members can diminish their representation in Congress and that of their states, reduce the cities' and states share of the $675 billion distributed by the federal government and lead to unsound legislation based on faulty numbers. On the other hand, groups and companies are uncertain how they can encourage families to fill out the census when they themselves do not trust the administration’s intention for including a citizenship question. The fear is so tangible, some people have stopped using safety net benefits available to their U.S. citizen children because of fear that it could lead to immigration arrests and deportations or keep legal residents from becoming citizens or sponsoring family members to come to the U.S. as legal residents, as NBC News has previously reported. Barreto told NBC News this week he is confident that census information would be kept confidential by this administration, just as Commerce Secretary Wilbur Ross pledged at a Latino Coalition-sponsored event on Tuesday in Washington. “I don’t think there is anything evil about knowing who is a citizen and not a citizen here, we should know that information. It’s what you are doing with that information,” Barreto said. “If you are using it to target people, that’s a problem. Working with them (Census) … I trust them,” said Barreto, whose group also worked on the 2010 census. But that trust isn't shared by most Latinos. A poll conducted by Latino Decisions polling firm for NALEO found that more than two-thirds — 68 percent — of Latinos said they think the Trump administration will share personal information collected by the census, including citizenship status. 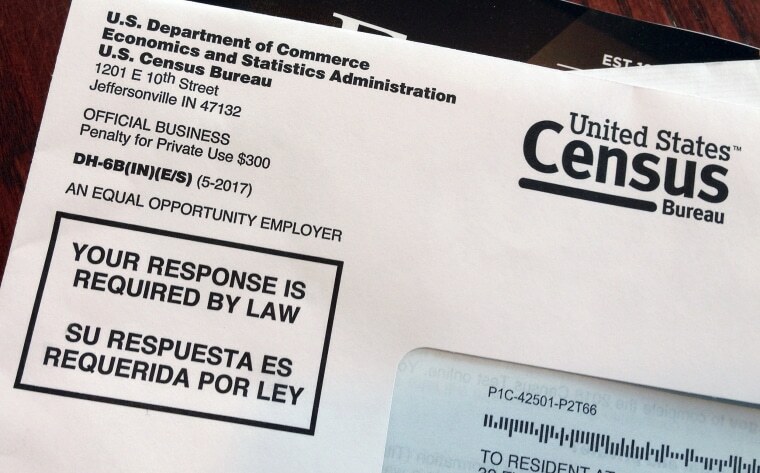 Several lawsuits have been filed challenging the census question. In a lawsuit filed in federal court in the Southern District of New York, the judge has ordered Ross and Justice Department official John Gore to submit to depositions. The administration is challenging that order. Meanwhile, the administration's nominee to oversee the 2020 census, Steve Dillingham, testified on Wednesday before the Senate panel considering his nomination. He declined to express an opinion on the citizenship question, saying it would be "problematic" to take a position. Adding the question to the census forms "certainly would provide another measure of citizenship," Dillingham said. But when asked if he supported adding the citizenship question and whether it would have a benefit, he said: "The decision ... will be determined by the courts and it will be my responsibility, if confirmed, to administer the decennial census in accordance with that decision." Of the 57 million Latinos in the country in 2016, 66 percent were U.S. born and 12 percent naturalized immigrants — immigrants who have obtained citizenship — for a total of 78 percent of Latinos with citizenship, according to an analysis for NBC News by Mark Hugo Lopez, director of global migration and demography at Pew Research Center. An estimated 13 percent of all Latinos, about 7 million to 8 million people are unauthorized, and about 9 percent are not U.S. citizens, but are not unauthorized, including an estimated 5 million Latinos who are legal residents, according to Lopez's analysis. Will Trump-era Census clip Latino political clout with citizenship question? Along with immigrants without legal status, some Latinos and others who are U.S. citizens have expressed skipping the census or the citizenship question in protest. NBC News reported in January that months before the Justice Department asked for the addition of the citizenship question, Census Bureau researchers were already witnessing fear in the community. Volunteers answering test questions and helping the bureau test technology were mentioning the "Muslim ban" and the administration's decision to end Deferred Action for Childhood Arrivals, or DACA, and repeatedly mentioned Immigration and Customs Enforcement, ICE. Members of the National Black Chamber of Commerce and the Asian/Pacific Islander American Chamber of Commerce participated in the event organized by the Latino Coalition, a pro-business group. "We think getting the word out on census and the rationale behind it and the benefits to the community, that's part of our role," Barreto said. He added that he recently spoke at an Orange County event that was full of Hispanic business people and there were no complaints about the question. The census has long relied on a network of local leaders, civic and community organizations, teachers, priests and others to encourage people to fill out the census. Known as “Trusted Messengers,” they do the work without pay. But Vargas said a group of national funders has been trying to get corporations to be “trusted messengers” who help encourage census participation, but “many are afraid to do that this time around because of the citizenship question," Vargas said. “For them, the issue is becoming toxic and they are afraid of associating themselves with something so controversial,” he said. Will new Census question impact the partisan makeup of Congress? Ross stated in remarks prepared for the Latino Coalition event and posted on the census website that the bureau will launch a National Partner kickoff in April 2019. Ross stated the bureau plans to hire more than 1,500 "partnership specialists" by the height of the census that will work with organizations that partner with it to encourage turnout. Also, he said that 40 of its partnership specialists already are in the field. The bureau also has asked states to form "Complete Count Committees" to encourage participation. He said the District of Columbia and 38 states have done so. "And our national partners help to emphasize that — by law — the census is strictly confidential. Responses are not shared with anyone outside of the Census Bureau," he stated in his remarks. But Vargas, who is a member of the Census National Advisory Committee on Racial, Ethnic and Other Populations, said the bureau is relying too much on community and civic groups to do the work of figuring out how to overcome the distrust created by the administration. When Ross announced the citizenship question's inclusion in March, he said in a memo that the Census Bureau and "stakeholders" had raised concerns that the citizenship question would "negatively impact the response rate for noncitizens," Pro Publica reported. But he also said neither the Census Bureau or the stakeholders could document that "the response rate would, in fact, decline materially." NALEO is assembling the National Latino Commission on Census 2020, which held its first meeting last week in Los Angeles. It plans others around the country, including possibly in the Texas Rio Grande Valley, Central Florida and in Puerto Rico. The coalition of nine elected officials is taking testimony from key areas so the challenges the question is creating in those areas can be fully documented. Vargas said the bureau's reported plan to hire only U.S. citizens as census takers could create problems for finding people who can speak Spanish, Vietnamese, Hmong, Thai and the many other languages spoken in the country. “Those are the barriers we are facing and we are going to have to figure out how to overcome them and we need the Secretary of Commerce to acknowledge the situation he has put us in,” Vargas said. Trusted messengers aren’t needed for high-income, educated communities, they are needed to go to West Los Angeles and south San Antonio, Vargas said. “They are needed to go to hard to count barrios, ghettos and immigrant enclaves," he said. "That’s where it’s going to be so hard for them to say, ‘Yes, we are asking about your citizenship, don’t worry.'"